I am very excited to introduce you to my new website! It features a mixture of Modern and Modern Vintage and Bespoke pieces of jewellery. For the Modern collection I have cast some vintage pieces in 9c gold and silver. 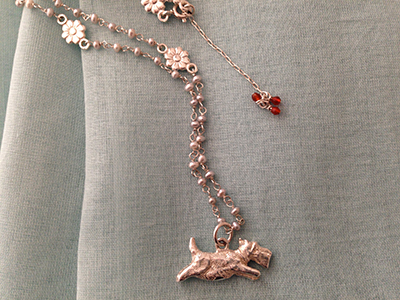 So now I can create repeatable jewellery with a vintage inheritance. 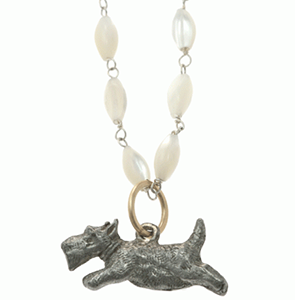 The inspiration came from loving this 1960’s pewter terrier and wanting to be able to use it in more of my designs. The Modern Collection is fresh, precious and versatile. The jewellery designs can be made in any metal and combined with most stones, so please ask if you are interested in any variations that are not on the website. The Modern Vintage limited edition collection will be built up gradually. At the moment there are four pieces combining vintage and modern elements which can only be reproduced a certain number of times giving them a rarity value. The Unique gallery showcases pieces I have made from vintage or antique finds combined with contemporary elements and are definitely one of a kind. Please let me know if you are interested in any of these or if you would like me to source something similar. This leads me to the Bespoke section which illustrates designs created especially for clients who have been involved in their commission. I would love to know what you think of the collections and the new website.